Whether you decide to drive it, paddle it or even hike it, you can explore a wide variety of sights as you traverse through northern Illinois and southern Wisconsin’s Rock River Valley. The Rock River ties together all of the nearly 40 communities along the Rock River Trail. Travel by car and you’re likely to spot scenic vistas, quaint hometown shops, historical destinations and plenty of unique finds. Whether you follow the Rock River Trail by driving it, paddling it, or even hiking it, there’s one thing everyone can agree on. “There isn’t one reason why people would say this trail isn’t interesting,” says Therese Oldenburg, a member of the Rock River Trail Initiative, which established and supports the trail. Created in 2010, the Rock River Trail showcases northern Illinois and southern Wisconsin’s Rock River Valley, which stretches 320 miles northeast from its meeting at the Mississippi River at the Quad Cities. This route no mere recreation path. 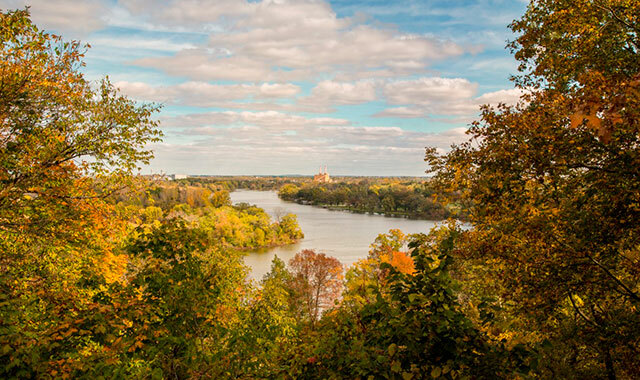 While it does follow bike trails in some places, and people have been known to kayak or canoe it, the Rock River Trail is truly a scenic, recreational and historic route that traces the river. From the trail’s beginning in Waupun, Wis., to its terminus in Rock Island, Ill., travelers can meander through 37 riverside communities, each with its own character, history and charm. “It’s a turn-by-turn trail, so people can follow maps that we have,” Oldenburg says. Maps are available online at rockrivertrail.com, but signage is posted abundantly along the trail, informing travelers what they might find during their journey. “Part of the river trail has places where people can camp overnight, and there are places where people can enter and exit the river,” Oldenburg says. One common way to experience the trail is by following a network of bike routes along the river. Those who enjoy a more leisurely way of taking in the sights and sounds will enjoy driving the trail’s designated roadways. In between stunning views of the river’s landscape, there are plenty of places to stop and explore. This being a historical route, you can expect to see numerous historic landmarks and points of interest, including Lorado Taft’s American Indian statue, which rests high above Oregon, Ill., and former President Ronald Reagan’s boyhood home in Dixon, Ill.
“This historical route lets people know all about what these awesome river communities have to offer,” Oldenburg says. In more recent years, additional activities have been added to the trail, including routes for birding and local chocolate stores. On the latter tour, take your pick of 24 candy shops where local chocolatiers create decadent, sweet treats. “We’ve had people drive the route just to check out some of the chocolate shops,” Oldenburg says. Last year’s addition of a birding trail offers ideal vantage points for spotting birds along the river. Five cities in Wisconsin have been designated as official Bird Cities by Bird City Wisconsin, a group that encourages bird conservation as well as habitat preservation and restoration. Each Bird City is along the trail. You’ll spy birds not just along the riverbanks but around the many wildlife refuges, state forests, and parks that provide habitat and food sources birds depend on. During the spring and fall migration, millions of birds travel along the Rock River flyway. “People really love to go birding, and a it’s a huge tourist attraction,” Oldenburg says. Keep an eye out for the latest addition, set to debut this spring: a Wine and Beer Trail, highlighting unique wineries, craft breweries, distilleries and waterfront dining areas. The trail also includes a hiking route, a horse trail, an art route and an air route, which encompasses 10 airports near the river. The Rock River Trail Information Center will open in June at Nature At The Confluence, 306 Dickop St., South Beloit, Ill.
“This will be a place where people can stop and ask someone what to do and what to see on the trail,” Oldenburg says. No matter which route you choose, you can follow it at your own pace. Some people decide to complete it all in one day, while others take their time and enjoy everything along the way. Some have even been known to jump in a kayak or canoe and disembark as they please. This entry was posted on Tuesday, April 9th, 2019 at 12:00 pm	and is filed under Recreation & Destinations, Top Posts. You can follow any responses to this entry through the RSS 2.0 feed. Both comments and pings are currently closed.